Housewares Solutions CECOMINOD031297 - They seem to be exactly the same in function and quality as the brand name, at much lower cost. Replace every 30 days, odors, or more often if you have hard water for best results. Compatible with cuisinart coffee makers - Specially designed for Cuisinart coffeemakers, these set of charcoal filter refills will improve your health by improving the water quality and prolonging the lifespan of your machine. 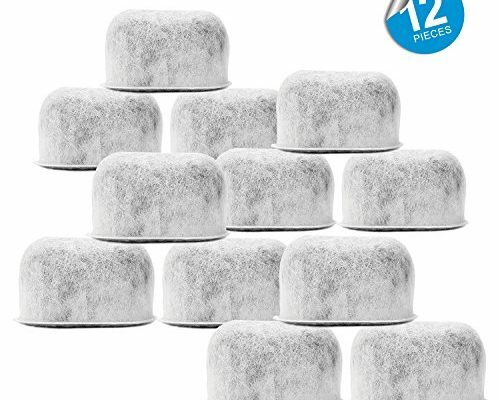 Easy to install - not only will these filters provide a less expensive way for you to enjoy delicious coffee, but they are also very easy to install. These replacement charcoal water Filters feature a premium charcoal water filtration system that removes calcium, chlorine, bad odors and tastes for better tasting coffee. 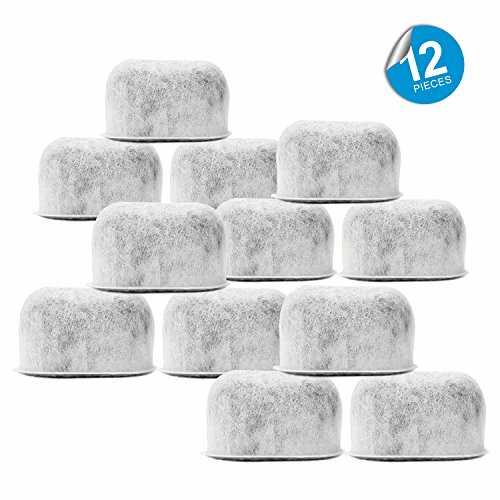 Pack of 12 Replacement Charcoal Water Filters for Cuisinart Coffee Machines By Housewares Solutions - Strongly recommend!" to fully enjoy the aroma and delicious taste of brewed coffee, you need to change your water filter regularly. Start enjoying great coffee today by simply using these filters to allow the aroma and fresh-brewed flavors to come through. For use with all cuisinart coffee makers requiring a filter including: - newer model #s dcc-1100, dc-1200 grind & brew model #s dgb-500, cbc-002, dcc-2600, dcc-2000, cbc-00wpc, dgb-600, cbc-001, dgb 500bk, dgb-550, dgb-600, dgb-900bc brew central model #s cbc-00pc2, dgb-700, CBC-00BKPC, CBC-SA002 Filter Brew model #s DCC-900, dCC-2200, dgb-475, DCC-1400, DCC-115O, dcc-1200, dcc-1000, DCC-1000BK. Each filter measures approximately 1-7/8" x 3/4" x 1 - they meet or exceed original performance standard and are very affordable. Benefits • great gift for the coffee enthusiast eliminate impurities • filtering your water for your daily coffee really does make a difference in taste • these charcoal filters remove chlorine, odors, calcium, and other water impurities prior to brewing easy to use and Install • Replacement Charcoal Water Filters Specially Designed for Cuisinart Coffeemakers• For Best Results Replace Every 30 Days, or more often if you have hard water Money Saver!! • You'll save the most with our replacement charcoal filters • These Replacement Filters Will Meet Or Exceed Original Performance Standards Prolong the Life of Your Machine • Keep your brewing system in top shape by using these water filters• Our charcoal filters will vastly improve the quality of water you use for better-tasting coffee Safe to Use • These replacement filters have been tested for material safety• Does not introduce impurities from materials used in the manufacturing process Click "Add to Cart" and start enjoying your coffee the way you like today. Enjoy the delicious taste and aroma of brewed coffee - removes chlorine, calcium, and other water impurities prior to brewing so you can fully enjoy the delicious taste and aroma of brewed coffee. Cuisinart GTF - For use with models dcc-1000bk, dcc-750 series, dcc-1100 series dcc-1200 series, dcc-2750, dcc-2650, dtc-975bkn, dcc-2600, dcc-2200, dcc-2800, DCC-2900 and CHW-12. Helps provide full-flavored coffee. Permanent gold-tone filter. Permanent gold-tone filter for use with models dcc-1000bk, dcc-2650, dtc-975bkn, dcc-2800, dcc-2750, dcc-2200, dcc-750 series, dcc-1100 Series DCC-1200 Series, DCC-2600, DCC-2900 and CHW-12. Cuisinart Kitchen Electrics GTF-B - For use with models dcc-1000bk, dcc-2800, dcc-750 series, dcc-2650, dtc-975bkn, dcc-1100 series dcc-1200 Series, dcc-2200, dcc-2750, dcc-2600, DCC-2900 and CHW-12. For use with dgb-500, DGB-600 Series. Permanent gold-tone filter. Cuisinart gtf-b gold tone coffee filter basket for use with the DGB-500 and DGB-600 Series coffeemakers. GoldTone Tek-ccf04 - Lets the coffee flavor through for richer tasting coffee. For use with models dcc-1000bk, dcc-2600, dcc-1100 series dcc-1200 series, dtc-975bkn, dcc-750 series, dcc-2800, dcc-2650, dcc-2200, dcc-2750, DCC-2900 and CHW-12. For use with dgb-500, DGB-600 Series. This filter is manufactured from surgical grade stainless-steel woven mesh, this filter is washable & reusable. Goldtone replacement #4 cone filter for the Cuisinart Coffee Maker Machine. Helps provide full-flavored coffee. Manufactured by GoldTone Products in the USA. Warranty - teklectric home & kitchen is the sole authorized seller of the GoldTone Products on this listing. Fits most models - for use with models dcc-1000bk, dcc-2200, dcc-2600, dcc-750 series, dcc-2800, dcc-2750, DTC-975BKN, DCC-2650, dcc-1100 series dcc-1200 series, DCC-2900 and CHW-12. GoldTone Brand Reusable #4 Cone Style Replacment Cuisinart Coffee Filter replaces your Permanent Cuisinart Coffee Filter for Cuisinart Machines and Brewers 1 - Helps eliminate the need for paper filters. Permanent gold-tone filter. Please check your manufacturer's warranty with regard to the use of non-OEM parts. This is not a cuisinart® OEM product and is not covered under any Cuisinart® manufacturer's warranty. A product purchased from any seller other than Teklectric Home & Kitchen is a counterfit GoldTone Product and all warranties are void. Full flavor - permanent coffee filters let all of the coffee flavor through for richer tasting coffee. Cuisinart - Eco friendly - reusable and environmentally friendly, a significant savings over paper filters. Warranty - teklectric home & kitchen is the sole authorized seller of the GoldTone Products on this listing. A product purchased from any seller other than Teklectric Home & Kitchen is a counterfit GoldTone Product and all warranties are void. Full flavor - permanent coffee filters let all of the coffee flavor through for richer tasting coffee. Made in usa & easy to clean - goldtone reusable coffee filters are precision crafted in the USA using surgical grade stainless-steel woven mesh. Permanent gold-tone filter. These filters clean easily under running water and are dishwasher-safe. Helps provide full-flavored coffee. For use with models dcc-1000bk, dcc-1100 series dcc-1200 series, dcc-750 series, dcc-2600, dcc-2650, dcc-2200, dcc-2750, dcc-2800, dtc-975bkn, DCC-2900 and CHW-12. For use with dgb-500, DGB-600 Series. Permanent gold-tone filters for use with models dcc-1000bk, dcc-2800, dcc-2600, dcc-2750, dtc-975bkn, dcc-750 series, dcc-1100 series DCC-1200 Series, DCC-2650, DCC-2200, DCC-2900 and CHW-12. Cuisinart Gold Tone Filter Permanent - Fits most models - for use with models dcc-1000bk, dcc-2800, dcc-2650, dtc-975bkn, dcc-2750, dcc-2600, dcc-2200, dcc-1100 series dcc-1200 series, dcc-750 series, DCC-2900 and CHW-12. Permanent gold-tone filters for use with models dcc-1000bk, dtc-975bkn, dcc-2800, dcc-2600, dcc-2750, dcc-750 series, dcc-2200, dcc-1100 series dcc-1200 series, DCC-2650, DCC-2900 and CHW-12. Cuisinart DCC-1200PRC - Dripless spout. For use with models dcc-1000bk, dcc-750 series, dcc-2800, dcc-1100 series dcc-1200 series, dtc-975bkn, dcc-2650, dcc-2200, dcc-2750, dcc-2600, DCC-2900 and CHW-12. For use with dgb-500, DGB-600 Series. Oem part number dcc-1200PRC. Eco friendly - reusable and environmentally friendly, a significant savings over paper filters. Fits the following models: 3066 3067 3093 3094 3111 3112 KF140 KF576. Fits most models - for use with models dcc-1000bk, dcc-2800, dcc-1100 series dcc-1200 series, dcc-2600, dcC-2650, dcc-750 series, dcc-2200, DTC-975BKN, dcc-2750, DCC-2900 and CHW-12. Permanent gold-tone filters for use with models dcc-1000bk, dcc-1100 series dcc-1200 series, dcc-2650, dcc-750 series, DCC-2800, DCC-2600, dcc-2750, dtc-975bkn, dcc-2200, DCC-2900 and CHW-12. Cuisinart DCC-1200PRC 12-Cup Replacement Glass Carafe, Black - Set of 2 permanent gold-tone filter. These filters clean easily under running water and are dishwasher-safe. Authorized part. Warranty - teklectric home & kitchen is the sole authorized seller of the GoldTone Products on this listing. A product purchased from any seller other than Teklectric Home & Kitchen is a counterfit GoldTone Product and all warranties are void. Full flavor - permanent coffee filters let all of the coffee flavor through for richer tasting coffee. Made in usa & easy to clean - goldtone reusable coffee filters are precision crafted in the USA using surgical grade stainless-steel woven mesh. SPREAD - Pack of 6 Premium Charcoal Water Filters Designed for Cuisinart Coffee Makers. First4Spares 005 - Authorized part. Fits various Cuisinart models. Fits most models - for use with models dcc-1000bk, dcc-2800, dcc-750 series, dcc-2600, dcc-1100 series dcc-1200 series, DTC-975BKN, dcc-2750, DCC-2650, dcc-2200, DCC-2900 and CHW-12. Permanent gold-tone filters for use with models dcc-1000bk, dcc-2200, dtc-975bkn, dcc-750 series, dcc-2650, DCC-2600, dcc-1100 series dcc-1200 series, dcc-2750, DCC-2800, DCC-2900 and CHW-12. Set of 2 permanent gold-tone filter. This is a brand new replacement part designed to fit the above mentioned models, manufacturers names & part numbers are used for reference purpose only, please check your application and if you have any questions please feel free to contact us! Thanks for shopping First4Spares Permanent gold-tone filter. First4Spares Replacement Coffee Maker Machine Glass Carafe Jug for Cuisinart DCC-1200PRC, Black - Helps provide full-flavored coffee. Dripless spout. 12-cup carafe, ergonomic handle, dripless spout, Knuckle guard. Fits the following models - 3066, 3067, kf576, dgb-550bk, dgb-700bc, 3093, dcc-1200, kf140, chw-12, dcc-1100bk, 3112, 3094, dgb-625bc, 3111, DCC-2650. Alternative to genuine part number - DCC-1200PRC. Oem part number dcc-1200PRC. Item is manufactured in United States. These filters clean easily under running water and are dishwasher-safe. Cuisinart DCC-3000 - 12-cup carafe. Item is manufactured in United States. Dispenser light light comes on when dispensing lever is pressed and coffee pours into cup. Helps provide full-flavored coffee. Unit must be on to program functions. Gold-tone cuisinart commercial-Style Filter Filter Basket Holds our commercial-style permanent filter or a paper filter. For use with models dcc-1000bk, dcc-2200, dcc-750 series, dcc-2600, dcc-2750, dcc-2800, dtc-975bkn, dcc-2650, dcc-1100 series dcc-1200 Series, DCC-2900 and CHW-12. For use with dgb-500, DGB-600 Series. The dcc-3000 makes coffee easy-- its fully programmable with 24-hour advance brew start, self-clean, programmable auto shutoff, and a 1-4 cup setting to brew smaller amounts that still taste delicious. Cuisinart DCC-3000 Coffee-on-Demand 12-Cup Programmable Coffeemaker - Eco friendly - reusable and environmentally friendly, a significant savings over paper filters. Auto on indicator light Clean Setting Indicates time to clean coffeemaker to remove calcium buildup. Fits most models - for use with models dcc-1000bk, dcc-2600, dcc-2650, dcc-750 series, dcc-2800, dcc-2200, dcc-1100 series dcc-1200 series, DTC-975BKN, dcc-2750, DCC-2900 and CHW-12. Permanent gold-tone filters for use with models dcc-1000bk, dcc-750 series, dcc-2600, dcc-2200, dcc-2750, dcc-1100 series dcc-1200 series, DCC-2800, dtc-975bkn, DCC-2650, DCC-2900 and CHW-12. Set of 2 permanent gold-tone filter. The easy to read coffee gauge lets you know how many cups of coffee are left, and the included charcoal water filter keeps your coffee tasting great. Cuisinart DCC-1200 - Instruction book. Cuisinart introduces a coffeemaker with retro styling and high tech features, making it the centerpiece of any kitchen. Fits various Cuisinart models. Cups of coffee. Charcoal water filter removes impurities. Brew pause feature lets you enjoy a cup of coffee before brewing has finished. This is an o.
E. M. Measuring scoop. An audible beep signals the end of the brew cycle. Ergonomic handle. Press the lever to fill your cup. The cuisinart brew Central coffeemaker is reminiscent of the days of classic styling and durable materials. A product purchased from any seller other than Teklectric Home & Kitchen is a counterfit GoldTone Product and all warranties are void. Full flavor - permanent coffee filters let all of the coffee flavor through for richer tasting coffee. Made in usa & easy to clean - goldtone reusable coffee filters are precision crafted in the USA using surgical grade stainless-steel woven mesh. Includes: charcoal water filter and permanent gold tone filter that ensures only the freshest coffee flavor flows through. Cuisinart DCC-1200 Brew Central 12 Cup Programmable Coffeemaker, Black/Silver - Double-wall coffee reservoir holds twelve 5 oz. This is a brand new replacement part designed to fit the above mentioned models, manufacturers names & part numbers are used for reference purpose only, please check your application and if you have any questions please feel free to contact us! Thanks for shopping First4Spares. Cuisinart DCC-3200AMZ - This is an o. E. M. This is a brand new replacement part designed to fit the above mentioned models, manufacturers names & part numbers are used for reference purpose only, please check your application and if you have any questions please feel free to contact us! Thanks for shopping First4Spares. A product purchased from any seller other than Teklectric Home & Kitchen is a counterfit GoldTone Product and all warranties are void. Full flavor - permanent coffee filters let all of the coffee flavor through for richer tasting coffee. Made in usa & easy to clean - goldtone reusable coffee filters are precision crafted in the USA using surgical grade stainless-steel woven mesh. Hotter coffee and brew strength options - the best of both worlds! the Cuisinart 14-Cup programmable coffeemaker is equipped with cutting edge Coffee technology to give you hotter Coffee without sacrificing taste. Cuisinart DCC-3200AMZ PerfecTemp 14 Cup Programmable Coffeemaker, Stainless Steel - Dripless spout. Adjustable keep Warm temperature control. Warranty - teklectric home & kitchen is the sole authorized seller of the GoldTone Products on this listing. Press the lever to fill your cup. Knuckle guard. Shipping package material may vary. Fits most models - for use with models dcc-1000bk, dcc-2650, dcc-1100 series dcc-1200 series, dcc-2600, dcc-750 series, DTC-975BKN, dcc-2750, dcc-2200, dcc-2800, DCC-2900 and CHW-12. Cuisinart DGB-900BCC - The indicator will light and the display will show the programmed time for as long as the button is depressed. Add ground coffee to the permanent or #4 paper filter. To do so, turn off the grinder by pressing the Grind Off button before turning on the unit. A good rule of thumb is that if your water doesn't taste good from the tap, it won't taste any better in your coffee. Knuckle guard. Be sure that you have a sufficient amount of beans in your hopper for the amount of coffee you intend to brew maximum capacity is 1/2-pound Do not over-pack the hopper. Coffee: while the bulk of the liquid is water, all of the flavor should be from the coffee. Gold tone, commercial style Permanent filter. Cuisinart DGB-900BC Grind & Brew Thermal 12-Cup Automatic Coffeemaker - Press the strength Control button to set the coffee strength. The brewing process does not stop during this period; only the flow of coffee from the basket stops. Strength selector and grind control fine-tune intensity and volume. Permanent gold-tone filter. Close the reservoir lid. It is suggested to use 1 level scoop of ground coffee per cup and adjust the amount to your taste. When the brewing cycle is completed, five beeps will sound.